The OECD Programme for International Student Assessment (PISA) examines not just what students know in science, reading and mathematics, but what they can do with what they know. Results from PISA show educators and policy makers the quality and equity of learning outcomes achieved elsewhere, and allow them to learn from the policies and practices applied in other countries. 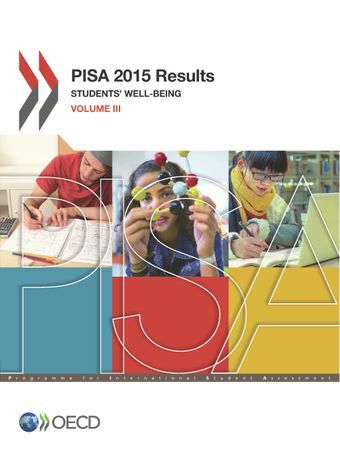 PISA 2015 Results (Volume III): Students’ Well-Being, is one of five volumes that present the results of the PISA 2015 survey, the sixth round of the triennial assessment. It explores a comprehensive set of well-being indicators for adolescents that covers both negative outcomes (e.g. anxiety, low performance) and the positive impulses that promote healthy development (e.g. interest, engagement, motivation to achieve).Children spend a considerable amount of time in the classroom: following lessons, socialising with classmates, and interacting with teachers and other staff members. What happens in school – as well as at home – is therefore key to understanding whether students enjoy good physical and mental health, how happy and satisfied they are with different aspects of their life, how connected to others they feel, and the aspirations they have for their future.